I don't normally seek out sugary things. Just wasn't born with a sweet tooth. But I was near the soda cooler when I was struck with an irrevocable desire to quench a thirst my body normally reserves for a dry martini. 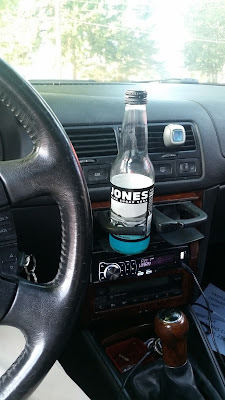 I was evaluating my choices as I neared and they came into focus, and I saw the Jones Soda options. I didn't feel I had a choice. The bottle pictured addressed me directly--promising a shotgun blast of memories of the time that I worked for the company. I tried to resist, but the bottle would not allow another selection to be made. I even tried considering another Jones flavor, but I wasn't allowed to choose any other. I picked up the bottle, but could not put it in my cart. The memory burst was demanding to be experienced--like a criminal I untwisted the cap and swigged wantonly. The siren's promise was unfulfilled. No flood of memories like an acid flashback, no good vibes or fond thoughts from that little slice of my life. Just some really, really sugary soda. And a buck seventy nine gone from my wallet. But it was my favorite flavor, which is weird for a guy that doesn't really like sugary things.